Pictured here, Rohingya refugees including women and children cross from Myanmar into Bangladesh at Palong Khali in Cox’s Bazar district. Nearly six months after an outbreak of violence drove almost 700,000 minority Rohingyas from Myanmar to seek safety in Bangladesh, senior United Nations officials on Tuesday said it is time to address the root causes – including decades of repression inside Myanmar – so those who fled feel safe enough to return to their homeland. “We are now in a race against time as a major new emergency looms,” United Nations High Commissioner for Refugees Filippo Grandi told the Security Council via videolink from Geneva, Switzerland. 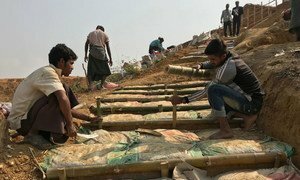 He said that the Kutupalong area in Bangladesh’s Cox’s Bazar is now the largest refugee settlement in the world, and with the monsoon season to start in March, 107,000 refugees are estimated to be living in areas prone to flooding or landslides. He said that conditions are not yet conducive to the voluntary repatriation of Rohingya refugees to Myanmar. Filippo Grandi (on screen), UN High Commissioner for Refugees (UNHCR), briefs the Security Council meeting on the situation in Myanmar. “The causes of their flight have not been addressed, and we have yet to see substantive progress on addressing the exclusion and denial of rights that has deepened over the last decades, rooted in their lack of citizenship,” Mr. Grandi said. “It is time to bring an end to this repeated, devastating cycle of violence, displacement and statelessness to invest in tangible, substantial measures that will start to overcome the profound exclusion that the Rohingya community have endured for far too long,” he added. Also addressing the Council was UN Assistant Secretary-General for Political Affairs Miroslav Jenca, who said that while there has been certain progress on the three priorities laid out by the Secretary-General, not all have been implemented thus far. Turning first to the need to end violence and improve the security situation, he said that although large-scale acts of violence have subsided, concerns about threats and intimidation against the remaining Rohingya population from Bamar and Rakhine communities, as well as from militia and security forces in Rakhine state, persist. Miroslav Jenča, Assistant Secretary-General for Political Affairs, briefs the Security Council meeting on the situation in Myanmar. Second, the UN does not have sufficient access to make a meaningful assessment of the humanitarian or human rights situation in Rakhine. As for the third point, which is voluntary, safe, dignified and sustainable return of refugees and internally displaced people to their places of origin or choice, Mr. Jenca said the Government has taken some high-level steps to advance this process, including the convening of an Advisory Board, whose recommendations include the inclusion of the UN at an early stage, soonest full humanitarian access, wider media access, and the formation of an independent fact-finding commission. Mr. Jenca called on the authorities in Myanmar to release the arrested two Reuters journalists and respect the right to freedom of expression and information. “These and other shocking reports of grave abuses demand our attention and action, for the sake of lasting peace and justice,” he said.